For those who haven't read our earlier episodes, this is an update on the GREEN RIDERS: Southeast Asia's ongoing adventure among forest and city, oceans and villages. On the boat from Singapore to Batam and then Djakarta, Jamie Raskin and Kenny Peavy are now beyond the Asian mainland and biking on water! They actually took a ferry after 1000km of biking, to their third and last country-Indonesia, but don't worry the pedals won't get rusty (as if!). They reach Java next and begin a mass of Indonesian eco-enviro-idylls before the eventual target of the island of Bali. The Kuala Lumpur and Singapore stretches of the journey saw lots of workshops and cycle gear sponsorships. This is all grist to the mill of eco-friendly cycling of course. You may have followed the Tour De France and be ready for Olympic cycling but these guys get their hard-tails moving' throughout the whole of these "short" events. The green part of the journey of course involves rainforest species (see the list on our last report!) and the human species trying to gain a foothold for environmental activities (among the rubber plantations of Malaysia for example). Bamboo manufacturers get a really large dose of publicity from Kenny and Jamie's bamboo bikes and many other eco-friendly products such as this mason bee house. 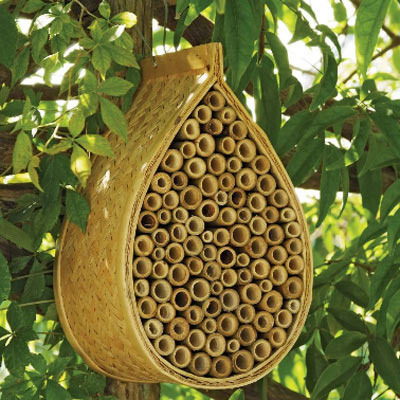 Such bee houses are universal these days, so there's an idea for a different use of bamboo for your own garden. Meanwhile, apart from giant amounts of time at workshops and educational work, The Green Riders share stories, "of their adventures thus far and exploring the possibilities of conservation, sustainability, social responsibility to raise awareness and inspire action for preserving our natural heritage for future generations." - says Jamie of their Friday (20th) evening event in Singapore. Best of luck on Java, guys!